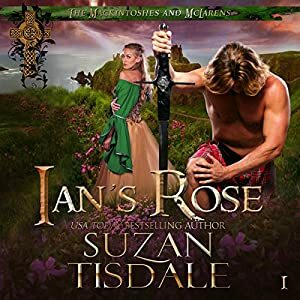 Published by: Targe & Thistle, Inc.
My Thoughts: I loved this emotional, multi-layered tale of a love which withstands Ian’s self-doubt, belief in his unworthiness, and his stubborn-headed decision to stay clear of Rose. Outside danger threatens to shred their new understanding and new beginning. Rose knows she loves Ian, but also knows she can’t give him children, for she is unable to carry beyond her 3rd month. How can a man love a woman enough to forego any hope of bairns? Rose is a feisty, spirited woman, passionate in nature and deeply in love with Ian. A woman no finer. The first scene sets the tone of Ian’s love. Narrator Brad Wills uses a soft intimate and loving tone in the first dialogue between the two. A secret betrothal is made between the two and a month later Ian breaks the betrothal sending Rose into a spiraling depression edged with lots of anger. Ian’s reasoning is simple. He can’t offer Rose the kind of life she should have—no large keep or pretty clothes. He is but a warrior and that’s all he’s good at, his justification for his actions. Luckily, Rose is given solace by her best friend, Aggie, wife to Ian’s brother Frederick, who also has a strong will. We are privy to some really cute scenes when Rose doesn’t exactly tell the truth. These discussion are difficult for Ian and Rose, but, truthfully, they were fun to listen to. The narrator entertains us with his flexible impersonations for each character. From an agitated, upsetting Aggie who is unable to control her speech impediment of stuttering, to a more than drunk Ian, drinking his woes of not having Rose – the love of his life, to a manical laugh of a man of greed and seemingly unhinged. They accept this opportunity, although it will be difficult for them. Ian is buoyed and tackles the project with both McLarens and Mackintoshes on the McLaren’s land. Hardships of building a new keep and forging a strong bond between the Mackintoshes and McLaren is a great burden to both Ian and Rose. The keep is starting to come together. But evil lurks out beyond the temporary walls. Rose is taken hostage by the new chief of the Bowie clan. He’s a man who is used to thieving and stealing from his neighbors. So why not the wife of clan who has money? Greed is a very dark motivator which brings pain and death to many. Snakes lie within walls. You will love the intrigue. Loyalty can be bought. It can also be gotten by other means. Who is truly loyal? Friendship is a keep element in this story. The secondary supporting characters who go beyond what is expected are a compelling force in their own right. They shall have their story in book two. Tisdale included the prologue of book two to the listen. I’ll be eagerly reading book two real soon! Book three just released this last week. 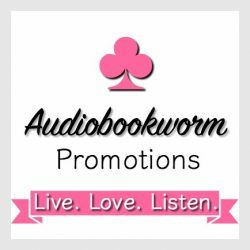 This entry was posted in Action/Adventure, Audiobook, Audiobook Review, Highland Romance, Highland Stories, Historical Romance, Medieval Romance, Romance and tagged Audiobook Review, historical romance, Ian's Rose, Suzan Tisdale, The Mackintoshes and McLarens Series. Bookmark the permalink. Suzan Tisdale write great love and escape novels. She is one of my favorite authors!